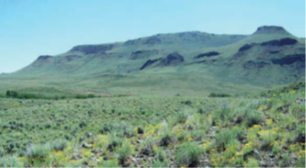 The Greater Sheldon-Hart Mountain Wildland Fire Resilient landscape is one of the few large, intact sagebrush-steppe ecosystems remaining in the West. Sagebrush ecosystems are critical to hundreds of species of wildlife and plants that depend on these habitats of the Great Basin high desert. The landscape is comprised of the Pacific Region of the U.S. Fish and Wildlife Service (USFWS) and Bureau of Land Management lands, the Summit Lake Paiute Tribe reservation, and state and private lands. It covers approximately 4 million acres of sagebrush-steppe in south central Oregon, northern Nevada and northeastern California. These are high priority landscapes, as identified by the Conservation Objectives Team (USFWS, 2013) in "The Strongholds Memo" (USFWS, 2014). The purpose of the Collaborative is to increase coordination between ongoing and future efforts of all partners and to strategically identify work that increases the resiliency of the landscape. This area of the northern Great Basin is a fire-adapted landscape that has experienced increasingly large wildfires over the last few years. Fires are expected to increase as the climate continues to change. This area has not yet experienced the damaging landscape-scale fires that have caused extensive conversion to invasive plants in other areas, and invasive plants are currently at low to moderate levels. Therefore, a proactive, collaborative approach to managing these invasive plants helps ensure conservation of these lands for the future. The Collaborative is increasing on-the-ground delivery of fuels treatments to reduce the risk of damaging wildfire and increase resistance to invasive species across the northwest Great Basin. The Collaborative’s treatments are being conducted over a 5 to 10-year period and will result in treating multiple areas using prescribed (planned) fire operations and mechanical treatment methods to maintain the integrity of the sagebrush-steppe, bitterbrush, and aspen communities, and manage for intact native understory grass, shrub, and other plant components. These treatments maintain a balance between juniper and sagebrush-steppe habitats, providing habitat diversity and structure. The Greater Sheldon Hart Mountain Collaborative supports both the goals of the National Cohesive Wildland Fire Management Strategy and the principles of SO 3336—Rangeland Fire Prevention, Management, and Restoration. It is funded by the Department of the Interior Office of Wildland Fire Resilience Lanscape Activities.